After the Confidence Vote, What's Next for Berlusconi? Berlusconi: Is His Latest Scandal the Last Straw? In Italy, it's time to pick up the pieces. Even as shopkeepers in Rome were rolling up their shutters after fierce riots engulfed much of the historic center on Tuesday, Prime Minister Silvio Berlusconi was reaching out to centrist parliamentarians, hoping to bolster the thin majority with which he had barely survived a vote of no confidence earlier on the same day. The final votes had yet to be counted when Berlusconi crossed the floor of Parliament to exchange jokes and pats on the shoulder with Pier Ferdinando Casini, the silver-haired leader of the Union of the Center, a coalition of Christian Democrats that has joined the opposition in defying the Prime Minister. After a tense parliamentary session in which the Premier's opponents accused him of vote buying and clinging to power for personal gain, Berlusconi emerged bloodied but victorious, with 314 votes to his opponents' 311. The margin, secured with the defection of six politicians from left-wing and centrist parties, was enough to carry the day. But it fell two votes short of an absolute majority, meaning the Prime Minister will need the support of moderates like Casini if he is to continue to hang on to power, much less pass much-needed reforms. "Those 314 votes are enough to allow Berlusconi to float on a little while longer," said Nichi Vendola, the governor of Italy's southern region and a potential left-wing candidate for Prime Minister, speaking immediately after the vote. "But it's not enough to govern." While Berlusconi has wasted no time in trying to patch up his shattered coalition, the ongoing political instability means that recovery for the rest of the country is likely to drag on. As news of the Prime Minister's survival trickled out on Tuesday, protesters poured into the city center and demonstrations turned violent. Protesters in black masks and motorcycle helmets attacked banks and storefronts along Rome's most popular shopping street, pulling planters and garbage cans into makeshift barricades. In the historic Piazza del Popolo, a thick column of smoke rose from three burning cars, including a heavily armored police van. Tear gas floated in the air as riot police engaged in running battles with demonstrators who were throwing cobblestones. That evening, when the right-wing mayor of Rome visited the trash-strewn square to assess the damage from the worst violence the city has seen in decades, he was met with shouts and curses and quickly retreated behind a police cordon. The demonstrators, most of them peaceful, included students who were angry at cuts to university budgets, unemployed workers and victims of a 2009 earthquake that left many homeless and still waiting for the government to keep its promise to rebuild. "We don't like destruction," says a dreadlocked rioter, who gives his first name as Luca. "This is our city too. But they've been jerking us around for years. We needed to make ourselves heard." 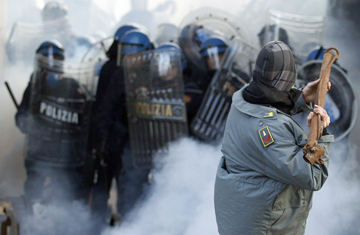 In Milan, another group of protesters stormed and briefly shut down the stock market. In the Sicilian city of Palermo, students crippled the airport. Italy hasn't taken on the kinds of severe austerity measures that have sparked similar violence in Greece, Spain and Britain. But the financial crisis has hit the nation hard, coming on the heels of a decade of little to no growth. Where other countries have boomed and busted, Italy has simply festered, and the slow-bleed de facto austerity has left many angry at what they feel is a lost opportunity. According to the Organization for Security and Cooperation in Europe (OSCE), Italy has one of the highest levels of taxation in the developed world, trailing only Denmark and Sweden, Scandinavian welfare states that are famous for their generous services. Italy's tax burden equals 43.3% of its GDP, but residents often say they feel they have little to show in return. Meanwhile, the country has the second lowest level of working young people, with just 21.7% of the country's citizens ages 15 to 24 employed, compared with an average of 40.2% among the 33 OSCE member countries. Only Hungary has a lower level. "In Italy, a young person can't even afford to live on his own," says rioter Luca, adding that he makes 400 euros a month working part time at a call center, and was disgusted by reports in the run-up to the vote that Berlusconi had offered opposition parliamentarians money and jobs in exchange for their support. "Being a politician is one of the quickest ways to become rich," Luca says. Given Berlusconi's razor-thin margin in the no-confidence vote, his next test is likely to come soon. The stakes could rise in January, when the constitutional court is likely to strike down a law that gives the Prime Minister immunity from ongoing tax fraud and corruption trials. His closest allies, members of the right-wing populist Northern League, have repeatedly said the coalition needs more votes if it is to govern. Many are expecting fresh elections in the spring, perhaps as early as March, and while Berlusconi could win another term, it's by no means a sure thing. In the meantime, Italy's frustrated citizens may have no choice but to wait. See if Silvio Berlusconi's latest scandal is the last straw. See the phrase bunga bunga in TIME's top 10 buzzwords of 2010.